Tiffany and Lupus: Healthy Nutrition for Lupus Warriors! Where are ALL my Lupus Warriors?! I want to see you raise those aching hands, go ahead, do it! Today we're going to learn how to become STRONGER by becoming healthier. Knowledge is POWER luvies, and we're going to educate ourselves to beat this battle called Lupus! I attended a Nutrition Seminar at the S.L.E. Lupus Foundation with a lovely lady named Brooke on May 11th and learned so much about how eating healthier can help Lupus patients immensely. Here I learned that we should all be eating FIVE servings of fruits and vegetables. This is the total amount, so you may pick and choose how many fruits/vegetables until you reach a total of FIVE for the day. 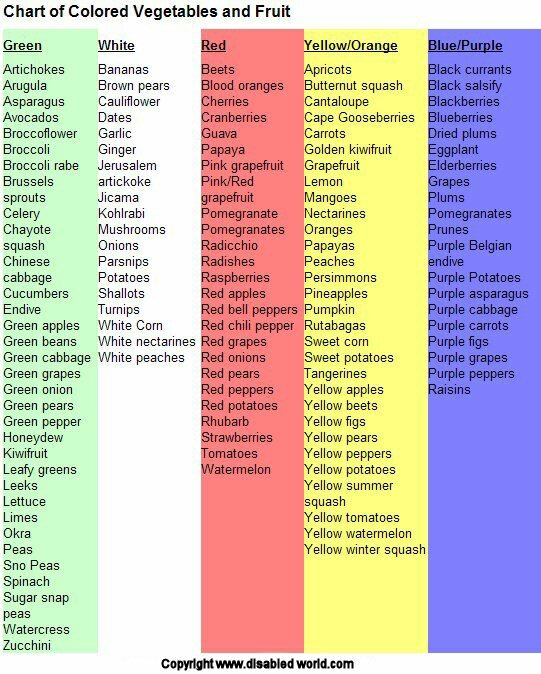 While this is important, you'd be surprised to learn that the COLOR of the fruit/vegetable you choose is also important! Each different color of fruit/vegetable contains a unique vitamin that is essential to our health! The processed foods that many of us eat could NEVER compare to natural whole foods, and are often the culprit behind why so many of us become sick. *Remember: According to the Food Pyramid POTATOS are NOT considered as a vegetable, because they are mostly consisted of starch, and should be eaten sparingly. Another good food component many people don't get enough of if fiber, found in fruits, vegetables, and whole grains. Beta-glucan, found in mushrooms, stabilizes and balances the body's immune system by supporting white blood cells. EGCG is found in tea and has been shown to reduce the risk of colon and breast cancer. It boosts the immune system and encourages T-cell formation, which defends our body against sickness and disease. Someone who is not able to eat five servings of fruits and vegetables each day can also drink fruit and vegetable drinks in their place. Although this shouldn't become a habit, fruit and vegetable drink mixes can be an excellent substitute when you're rushed or traveling. The need for fruits and vegetables in our diet is growing rapidly with the type 2 diabetes, heart disease, and high cholesterol, hypertension that result from the "Typical American Diet" of fatty meats, processed sugars, and refined grains. You can find lots of other great nutritional information at Disability & Health News ! In the end, it is up to only us whether we choose to make the right choices for our body. Sometimes we have to sacrifice the unhealthy things to prolong our lives. When living with Lupus it is extremely crucial what we put into our bodies. So many foods today are pumped with pesticides, hormones, artificial ingredients, MSG, etc... and the list goes on. We cannot afford to turn a blind eye to such matters, there are so many things about Lupus that we cannot control, however we CAN regulate what we put into our body, take care to make the right choices because it IS makes every difference from making the wrongs ones. As always be STRONG luvies! Together we can stand tall & Fight the never-ending battle. Never give In! Awesome post, babe!! Thanks for the color coded pic too. Very helpful. I'm a fruit girl, so eating five servings won't be that hard. Knowledge is power. Thanks for getting this out there. Make sure to include your veggies Luvie! It makes a difference in how your body feels daily! Muahz<3 Never Giving IN! Yes, dear ;) That's right, Never Give In! To cover your discoid rash or malar scars try Covergirl Simply Ageless with SPF & Bare Minerals powder with SPF 30.